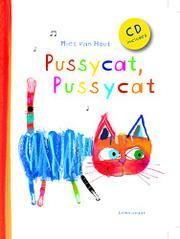 Colorful illustrations and simple nursery rhymes with an accompanying audio CD make up this picture book. On each double-page spread of this portrait-format picture book, colorful type tells a simple nursery rhyme, and the subject of the rhyme is illustrated with ample white space surrounding it. As a stand-alone picture book, it’s a bit rote, even if van Hout’s carefree, doodlelike illustrations are chock-full of whimsy. But once the CD is popped in, each spread comes alive as the uncluttered mother-and-daughter vocals of the Chambers Family turn the nursery rhyme into a little song. With the exception of the first song, which is 2 1/2 minutes, the rest of the songs are under 1 minute—even when they are repeated twice (a perfect opportunity for readers to sing along the second time). Some of the nursery rhymes are familiar, such as “Baa, Baa, Black Sheep” and “The Itsy Bitsy Spider,” but many are likely to be new to readers—and the one about the centipede is delightfully silly. The last rhyme, about a baby bird under its mother’s wing, is an especially satisfying way to end the book, but unfortunately the centrally placed illustration (like several others) suffers from being bisected by the gutter. It’s not terrible, but it is visually distracting.